I just killed a spider in my bedroom. It was fat and juicy. I threw a couple of empty boxes at the corner it was hiding in to no avail.. finally a book did it. I can see it squished into the corner, it's so gross... right beside my bed. :( I was about to turn off the light when I saw it. Now I can't sleep until i calm down a bit. What's everyone doing right now? I finally got James to watch the movie Gaslight, so we are about 2/3 through it right now. If you haven't seen it, you must! It is an old Ingrid Bergman, Charles Boyer, Joseph Cotten movie. It is the first movie that Angela Lansbury was in (she played the young maid, Nancy). I found the DVD on ebay. Well, thanks to you, looking for spiders!!! Ah spiders, aren't they lovely. I had one of those huge types in my room the other day, I had to grab it before it went under the bed, I didn't kill it though. I really hate having to grab them. After I "fled" from my first husband, I got this basement suite that was a real dump but it was hard to find (or so I thought, but that is another story). You had to go through a hole in the fence on the side of the house and around back, then my front door was actually a glass patio door with a lock on it. The place was full of holes and out of those holes came all sorts of spiders. A friend came and duct-taped them all for me, but I was forever on the look-out for 8 legged creatures. I feel for you Saph! I've seen it a few years ago . When we first moved into this house last year, most of the back yard had not been mowed all summer. The grass was about 4" tall at the highest. As soon as I started mowing, I noticed all sorts of critters living in the grass. Crickets, thousands of them. Lots of Wolf Spiders that were living on the crickets. 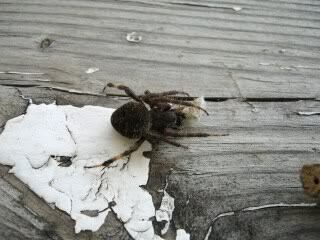 In the first week or so, I saw a Wolf Spider in the garage that had to be 2" in diameter. I've got a picture of that one. Wolfie's are you friend, so don't disturb them, at least that's what I try to convince PeppA of that. We've seen a few tarantula's out on the roads, but never in the yard itself. Here is an orb weaver that was on the corner of the garage the other day. I got it down to take a picture and then took it out back and let it go........all on the end of a bamboo plant stake!